A beauty without stereotypes. At one point or another we all have been judged or stereotyped into something- to what we should do, how we should be, even with how we should look. You've probably heard phrases like "beauty and intelligence don't go together", "women are fragile and need extra care", "the perfect woman has x hair color, eyes and/or skin" to even phrases like "women over 30 are considered old". I admit these thoughts have gone through my head a number of times and I have battled with the concept of time and age a lot. Why is it that every time our birthday comes along we get this sudden rush of fear? Is it because we are truly scared of aging or is it because society has instilled in us the idea that every year older, every wrinkle or an expression line is a symbol of our youth coming to an end? Isn't youth in our attitude towards life versus a specific age number? I constantly look at people around me and can spot women that are exemplary role models in my life. My mother for example. She is 62 years old, free of any surgery, and is by far the most beautiful woman that I know. She carries her 62 years with pride and every wrinkle that she has is shown off with absolutely no fear. I have to admit, she has never let time take a toll on her and she always has taken excellent care of her skin. She has never tanned, does not go out in the sun without protection, has an excellent skin regime, and thanks to her, I do too. Looking at her example, and the example of several women in my family, I have realized that the way they view life and themselves, is about making time an ally versus an enemy. If I really think of all the things I have accomplished by 32- the illnesses I have overcome, the educational goals I have accomplished, the fact that I'm the 'little one' of the house and I have had my own business for the past 6 years.... every little small or big thing that I have created by this age has made me who I am and I'm very proud of that. Una belleza libre de estereotipos. Todos hemos sido juzgados y estereotipados- desde qué deberíamos hacer, como deberíamos ser, hasta como nos deberíamos ver. Seguramente has escuchado cosas como "la belleza y la inteligencia no van de la mano", "la mujer es frágil y necesita de cuidados", "la mujer perfecta tiene x color de pelo, ojos y piel", como también "todas las mujeres arriba de 30 ya están viejas". Admito que hasta a mi se me ha pasado por la cabeza y he batallado con el tema del tiempo y la edad. Porqué es que cada año que pasa en nuestras vidas tenemos miedo de envejecer? Es porque de verdad tememos a envejecer o es porque la sociedad ha puesto ese chip en nuestras cabezas de que tener una arruguita o una linea de expresión es simbolo de que se viene el fin de nuestra juventud? Acaso la juventud no es una actitud, en vez de ser dictada por una edad determinada? Constantemente veo personas alrededor mío que son claros ejemplos de vida. Mi madre, por decir, tiene 62 años, libre de cirugias y es la mujer mas bella que conozco. Lleva sus 62 años con orgullo y cada una de sus pequeñas arrugas las muestra sin temor. Ahora, como ella, son pocos. Ella siempre se cuido del sol, siempre cuido su piel al extremo con rutinas de belleza y es gracias a ella, que yo también lo hago. Al ver su ejemplo, y el ejemplo de muchas mujeres en mi familia, es que el tiempo se vuelve un aliado para mi versus un enemigo. Me pongo a pensar en todas las cosas que he llegado a cumplir en mi vida hasta los 32- desde las enfermedades que he logrado batir, las metas en mi educación que he logrado cumplir, en el hecho que soy la 'chiquitita' de la casa pero ya tengo una empresa propia hace casi 6 años y cada una de las pequeñas o grandes cosas que me hacen la persona que soy ahora. Realmente estas cosas me hacen sentirme orgullosa. When it comes to how we look, the most important thing of all is for us to be comfortable in our own skin. 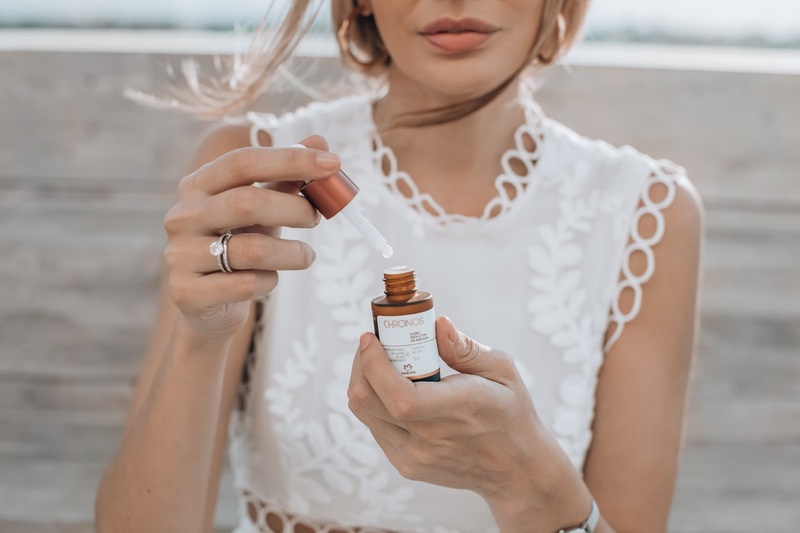 Achieving that seems harder than it really is, but the truth is, it's all about having the appropriate care routine that is suitable for our skin type and one that focuses on the health of it first- the appearance, second. 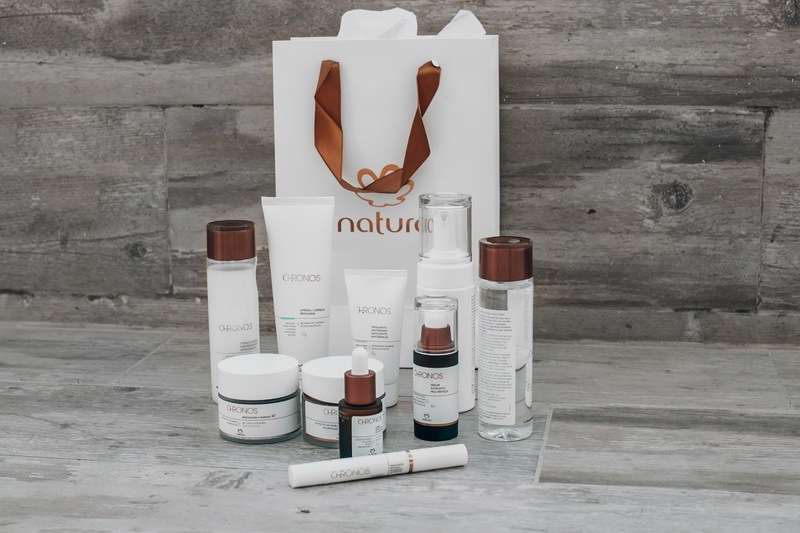 As some of you that have read my blog for the past years know, I have used Natura's Chronos for two years now and I'm talking about the WHOLE skin routine. 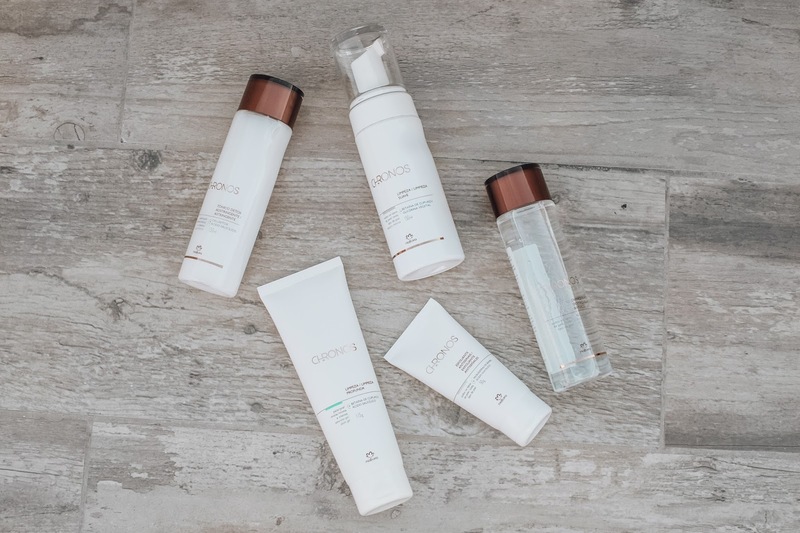 Taking care of your skin isn't just washing your face before bed, it takes an actual process that is composed of using different products targeting different skin problems. Below I'm going to walk you along a proper skin care routine so you too can learn how to proper take care of yourself. Es importante que nosotros estemos orgullosos y cómodos con nuestra belleza natural y uno de los formas mas faciles para hacer eso, es cuidar nuestra piel. Porqué quien no luce con orgullo una piel saludable? Nuestro momento de vivir es ahora y también nuestro momento de cuidarnos. Como saben, la linea Chronos de Natura es la rutina mas completa de cuidado de piel y una que me ha acompañado por mas de dos años. A continuación les contaré un poco de la secuencia correcta de uso de esta rutina y los productos necesarios para darle el cuidado necesarios a nuestro rostro. CHRONOS crema de limpieza, exfoliante, espuma, tonico y desmaquillante bifasico. CLEANSING ROUTINE- In my personal opinion, the cleansing part, is not only the first, but the most important part of the whole routine. This is where we prepare our face for the next steps to take action. A well cleansed face means its free of impurities, toxins, dirt accumulated and it is ready to receive and absorb the stronger products that target skin problems. Depending on the type of skin that you have you will prefer cream cleansers vs foam cleansers. Exfoliating is a must at least once a week and a cleansing routine is not complete without a remove-all makeup remover! RUTINA LIMPIEZA- En lo personal la rutina de limpieza es la mas importante. Es aqui donde preparamos el rostro para todo lo demás, sin este paso, no puede hacer un efectivo trabajo el resto de la rutina. Aqui es donde removemos toda impureza, toxinas, toda suciedad en nuestro rostro acumulado y lo dejamos listo para que los siguientes productos puedan absorberse apropiadamente y tomar accion. Dependiendo de tu tipo de piel puedes escoger una crema limpiadora o una espuma, puedes seguir con un tónico y una vez por semana, exfoliarte la piel con un exfoliante adecuado para tu piel. Si es de noche, no te olvides de primero usar un desmaquillante para remover todo el maquillaje del dia. FIRMING ROUTINE- Step #2 is focusing on a firming routine and applying the super concentrated products. Just like the name says it, these products are star products that contain high concentrations of collagen that will help you get firmer and tighter skin. They usually come as serum-based products and not only work immediately but help you gradually for long term results. I usually look for products that focus on under eyes and crows feet therefore I am really enjoying the 'wrinkle filler' from Natura that comes with a booster of hyaluronic acid! RUTINA FIRMEZA- Paso numero dos es aplicar los superconcentrados. Nuevo para ustedes? Les cuento un poco sobre ellos. Los superconcentrados son productos estrella que te ayudarán a disimular de manera inmediata el aspecto de tu piel y actuará dándote resultados a largo plazo. Son tal como lo dice el nombre, altos en concentración de colageno que te ayudan con la elasticidad y firmeza de la piel y particularmente de los ojos. En esta categoría existen sueros con colageno para toda la piel y contorno de arrugas. PD. Les recomiendo el rellenador de arrugas (para arrugas profundas) con cacearía y acido hialuronico de Chronos. CHRONOS- kit antiseñales dia y noche con FPS 30. ANTI SIGNS OF AGING ROUTINE- After you have finished with step 1 (cleansing) and step 2 (super-concentrates), comes the final step in your skin regime, which is targeting the signs of aging. For this third and final step it is very important to find a cream for both day and night that is focused not only on your skin type but on your age. A woman in her 30's will not be looking for the same thing a woman in her 40's will. A woman my age will want a cream that focuses on hydration, elimination of fatigue signs and small lines of expression. A woman in her 40's will need a product that helps her with firming and luminosity. A woman in her 60s will need revitalization in her skin care routine and a woman in her 70's will want to look for a cream that helps her with restoration of her skin. Thankfully there are brands like Natura that walk with you along every stage of your life. RUTINA ANTISEÑALES- Luego de que los superconcentrados han penetrado en tu piel, es importante pillar una crema tanto de dia como de noche que vaya con tu edad. Una mujer de 30 no necesita lo mismo que una de 40, o 50- asi que es importante que sepas lo que tienes que buscar en una buena crema. Para una mujer de mi edad, lo ideal es buscar una crema que me dé hidratación, que elimine signos de fatiga y me ayude con las pequeñas lineas de expresión. Una mujer de 40+ debe buscar un producto que la ayude con la firmeza y luminosidad, una mujer de 60+ buscará revitalización y una mujer de 70+ buscará algo que ayude con la restauración de la piel. Es por eso que es muy importante encontrar marcas, como Natura, que te acompañen a través de cada etapa de tu vida.